Background image of A cloud stacks above the African savannah. 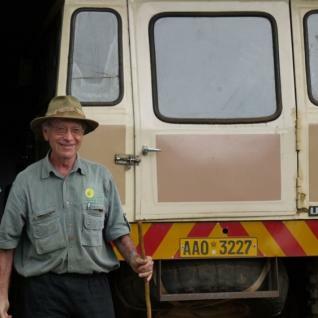 Dimbangombe Ranch, African Center for Holistic Management, Zimbabwe — Allan Savory has been at it for a long time. He is seventy-six and still going strong. It takes that long to work through institutional barriers to change. When Janie and I arrived yesterday there were fifteen cars and trucks in the entrance to the center. Government scientists from across the country had requested an impromptu visit to see what Allan is on about. Twenty to thirty students from nearby villages were doing intensive training in holistic management. Now I am sitting here at Allan and his wife Jody Butterfield’s home, a traditional camp beside a small stream in the African savannah of northwestern Zimbabwe. Thulani, the cook, is quietly fanning the ashes from last night’s chicken curry and scotch for morning tea. Smoke is wafting through camp. It is first light; cacophony of birds and bugs awakening. The stream is burbling over rocks, weaver birds overhead are busy nest building, wild guinea fowl and francolin are arguing among themselves in loud raucous bursts and doves are calling “work harder, work harder”, a call well known in southern Africa. Contrary to the doves’ advice, Allan is trying to at least partly retire, but it isn’t working. The earth needs him. Born in what was then Rhodesia, now Zimbabwe, Allan lived through turbulent times. As a young man he fought off polio and was always drawn to the bush. He was bored with school, hunted and fished, poached actually, in his words. He practiced falconry. After school Allan went to work as a biologist for the game department culling troublesome elephants and lions from game reserves. He fought hard to create parks and protected areas to defend the wildlife, and prevent the deforestation and degradation he saw around him. He walked barefoot for hundreds of miles in the forest and savannah. He was elected to parliament, and was drawn to the army where he trained and led a bush tracking combat unit based on his experience tracking wildlife and fighting poachers in the parks. He became a pilot to get the larger view and to travel the vast distances and to multi-task between army, parliament and managing his ranches. He was fighting “terrorists” for the Ian Smith government but was quickly disenchanted with the futility and racism behind 250,000 white colonists trying to run a country of ten million black Africans. As a member of parliament, Allan crossed the Floor in parliament, became an independent and led an opposition movement of moderate whites who sought an end to segregation and more effective governance for all Rhodesians. He was both hero and traitor to both blacks and whites. He lost his ranch to government forces wanting land for commercial hunting, but he persuaded parliament to turn it into what is now Kazuma Pan National Park. Ultimately he failed to get re-elected and had to escape the country to live in exile in the Cayman Islands, then Texas. That is a wild and oversimplified summary of a man used to overcoming opposition, but a taste of what we had come to learn. 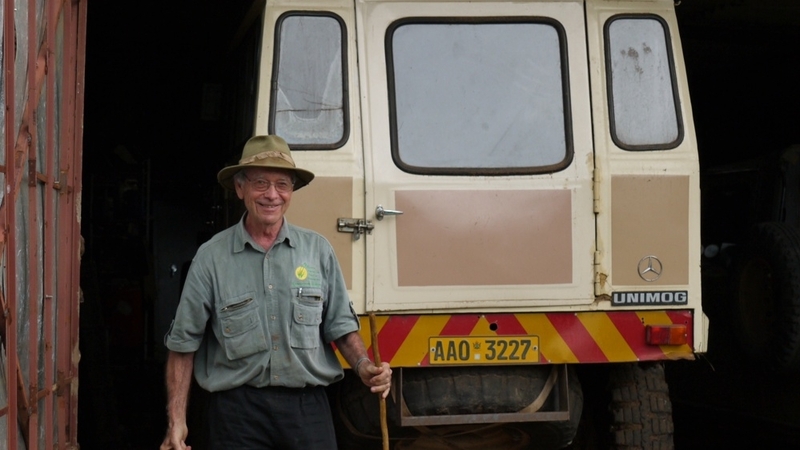 After breakfast of eggs and toast around the fire, we head off into the bush in a short base, ex- army Mercedes Unimog to help assure safe passage through overgrown dirt roads, wet boggy ground and large rocks. This was a refresher for me in holistic management, having taken a short course in Washington, DC in the early 1980s when I was developing The Nature Conservancy’s International Program. I was intrigued because here was a man much derided by scientists, bureaucrats and environmentalists alike for heretical views about grazing and the source of desertification, but he was someone who clearly had a deep ecological, military and political experience in the harshest imaginable conditions in the developing tropics. Anyone saying that we are doing everything exactly 180 degrees wrong was a source of interest to me. Like others around him Allan had assumed that the cause of soil erosion, grassland degradation, floods, biodiversity loss, poverty, and conflict in developing dry land countries could be traced to overgrazing, lack of science, poor governance, lack of private ownership and the string of usual cause and effect relationships so often cited by western development experts. But when Allan lived in Texas, where there was huge investment in land grant agricultural colleges, vast amounts scientific research, large private ranch lands, stable government and extraordinary wealth he found eroding soils and grasslands even more extensive than his homeland. Today there are more people in texan jails than there are on texan farms, he points out. And when he finally returned to Zimbabwe he found game disappearing and eroding soils inside the parklands which he had fought to create. Something wasn’t adding up. Inspired by the early work of the genius of Jan Christian Smuts, who wrote about holism in 1926 (see Holism and Evolution), Allan dug deeper and deeper to try to understand the ways in which the fundamental human decision making process thwarts billions of dollars of investment aimed at alleviating poverty, disease, floods and famine. He was trying to understand the true nature of the problem to discover lasting and meaningful solutions to seemingly intractable global problems. Now he is launching a “brown revolution” designed to address the two thirds of Earth’s terrestrial surface which is seasonally dry. Allan has identified two fundamental flaws in our decision making. First is the failure to make our linear, objective oriented decisions in the context of a broader holisticgoal (one word, a noun; holistic is not an adjective!) that address our deepest cultural, spiritual, social, and financial values in relation to our life support system. (How do you want your life to be is the key question, what do you value most deeply in life?) Nature, as Smuts pointed out many years ago, works in patterns and in wholes not in parts. Nature has no parts, there are no connections, only patterns and wholes. So our pursuit of narrowly defined objectives inevitably have unintended consequences on important but purposefully ignored relationships. We are constantly winning battles and losing the war, an insight that Allan came to early in life. One insight Allan points out is how good the human species has been at making things and how poor we have been at managing things, from organizations to businesses to natural resources. The other flaw is that we imagine too few tools in our human decision making toolbox. All fundamental tools, Allan believes, fall ultimately into just three headings: technology (from sticks and stones to, trade, finance and iPads), fire (discovered early in our evolution), and more recently “rest” (conservation, or leaving nature alone, or trying to). As Allan looked at basic life processes of birth, growth, death and decay, he realized in humid environments, the decay process was sustained by moisture and micro organisms throughout the year. In places like the coastal temperate rain forests of North America where Ecotrust does most of its work, resting a degraded forest ecosystem, protecting it from human intrusions, will allow it to recover. In seasonally dry, or what Allan calls “brittle”, environments on the other hand the decay process is interrupted by suddenly dry periods when biological decay virtually stops and the chemical process of oxidation takes over, sometimes hastened by natural or man caused fire. The huge mass of organic matter accumulated in wet, or more accurately humid, season, the tree leaf fall, grasses and forbs is largely lost to the atmosphere instead of building soil. Historically Allan surmised that huge and diverse herds of grazing animals, the buffalo, antelope, elephants, and impala, constantly moved by large predators, would break the drying soil surface, and recycle the mass of forage through dung and urine. Humidity and the critical biological process of decay was in the gut of herbivores. In the absence of this life giving, soil building, water saving, flood preventing, nutrient building process, the great mass of organic matter was largely lost to co2 dissipating to the atmosphere, contributing to, rather than ameliorating, climate change. In today’s absence of large native herbivores and their predators, two thirds of the earth’s terrestrial ecosystems are degrading, losing biodiversity, desertifying, losing agricultural and ecological productivity, driving herding, pastoral and subsistence agricultural people world wide to malnutrition, poverty, disease, war and terrorism. With existing tools of technology, fire and rest, we lack the tools to prevent desertification and an enormous source of climate change. No amount of investment addressing the symptoms, Allan argues, will be successful unless a new tool can be found to replace the once former source of soil building, the extraordinary abundance of herbivores and their predators. Thus the fourth tool in a more holistic management decision making toolbox, is the controversial role of increasing numbers of cattle and sheep, grazing in ways that more closely mimic natural processes to restore basic soil building processes and reversing desertification, biodiversity loss, poverty and its consequences. Increase grazing pressure? As Allan showed Janie and me countless areas on his ranch where intensive cattle and goats grazing for several days, up to a week, at a time, as part of holistic grazing management, had resulted in the restoration of previously highly degraded lands, I began to see the ideas in action. One small area was absolutely bare, encrusted soil that was maintained as part of a diverse landscape by excluding cattle grazing. To so many of us conservationists, scientists and agency land managers, especially those coming from more temperate and humid environments used to seeing cattle in streams eating out the willow, birch and fragile riparian cover across the western US, and millions of acres of “over grazed” public and private lands, Savory’s ideas were heresy. Cows in parks, not in my life! Sheep grazing Nature Conservancy grassland preserves instead of fire? No way! For decades Savory was ostracized, maligned and called every name in the book. Like the billboards saying “Hang Savory for treason!” that greeted him when he first returned to Zimbabwe, Allan was ostracized by the establishment. But gradually, incrementally, over the past forty years Allan has persisted testing his ideas, admitting his mistakes, returning always to the larger framework of holistic management. He is working with desperate ranchers Africa, Australia and the Americas, helping to save their livelihoods, searching for any way to save the family farm, or just those willing to try new possibilities and learning that properly managed increases in animal numbers and following the patterns of nature have shown prospects of improving financial, social and environmental goals in the larger context of people’s lives and their relationship to their whole life support systems. Successes are more prominent than failures. Allan says that Holistic management is now being practiced on more than 40 million acres worldwide. Yesterday another group of European and African experts came for a visit, this time leading scientists and international agency managers in agro forestry, showed up of there own accord to dig deeper into the profound insights of a heretic. Two years ago The African Centre won the $100,000 Buckminster Fuller award for global humanitarian work. This fresh funding supported the Center from the bottom up, starting with support for the herders and the Centre staff. US Aid recently awarded him $5 million to scale their learning centers. The nations that have committed $2 billion to alleviate poverty and reverse desertification in the horn of Africa are seeking his advice. He just signed a ten-year agreement with The Nature Conservancy and my friend Peter Seligmann at Conservation International is exploring collaborative work. Traveling in what we have metaphorically called The Magic Canoe, I spent a week on a Canadian icebreaker with senior government leaders and scientists last July on a “philosophers cruise”, a floating symposium addressing the effects of climate change in the Arctic. Little did I know even then that further downstream, I might find some causes, even a glimpse at possible solutions, in the African savannah of Zimbabwe. For more about The Savory Institute and the African Center for Holistic Management see www.savoryinstitute.com. Editor’s note: In 2012, Ecotrust founder Spencer Beebe is traveling the globe to discover stories of resilience. Join him and those he meets along the way in shaping — in new and unimagined ways — resilient communities, economies and ecosystems.